Angry Buyers - Cannon-based fun for all the family! Angry Buyers – Cannon-based fun for all the family! One of our latest projects, Angry Buyers, has recently been released into the wilderness. Developed for In-Deed, Angry Buyers is a game to reinforce their message of taking the stress out of buying a house. Not only was this a great game to work on (and play! ), but it was my first major project for a client here at Team Cooper. 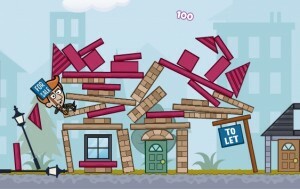 The game uses a cannon to launch the characters into a house or series of houses, with the aim being to destroy as many windows as you can. The cannon is a great method for launching the characters. They’re widely associated with the cartoon style of the graphics, it’s easy to pick up on how to use it, and, come on – who doesn’t want to see an estate agent getting launched out of a cannon?! With the nature of the game and the variation of characters, we had to think of ways to make them different from each other. The best solution here was to make them different weights and have different resistances. The mortgage broker is one end of the spectrum – he’s very heavy and doesn’t bounce a lot, if at all. The property lawyer is the other end. She’s very, very light and will bounce around a lot! In between these two, you have the estate agent, who is quite light and moderately bouncy. This variety of properties gives way to many different methods for completing levels. I tend to use the mortgage broker and aim for the top left corner of a house. In most cases, he will plummet through the roof destroying any windows in his way. The debris falling around him should destroy the others. However, having developed the game, I can say that I have no idea what the best method for breaking all the windows is. All I know is my best score is about 8000 and there are people on the leaderboard with over 12000! It would be interesting to know how those players, and others, play the game. Then again, a magician never reveals his secrets. The game was a lot of fun to develop. Quite a lot of time was spent tweaking various values and testing the game, tweaking them some more and testing again. Testing could often turn into prolonged bouts of trying to smash all the windows in one go, so the game appears successful in its addictiveness and sense of competition. Initially, we planned to have one very large level with the three characters giving the player the opportunity to cause as much damage as they could. Aside from the performance issues this raised, I believe the separate levels lay out works a lot better in terms of replayability. Some players will want to beat the level they find most difficult and others will want to perfect each and every level in order to maximise their score. Angry Buyers is available to play over at In-Deed’s website now, so go and launch some estate agents at some houses! You know you want to.